The Area 51 pack some impressive hardware into its extraterrestrial design, but only the true enthusiasts need apply. Alienware has always made interesting designs, but the 51 might be the first to properly live up to the brand name. What you're looking at is a total recreation of the Area 51 desktop PC, one that actually looks like something a martian might walk out of at any moment. As Steam Machines and other small form factor PCs (including Alienware's own Alpha) slowly chip away at the desktop enthusiast market, it's becoming increasingly difficult to make something that truly stands out. We can confidently say that Alienware has achieved that here. The shape is unusual, but not for the sake of it - the triad design makes the 51 more practical in some respects, which I'll come onto in a moment. Most importantly, the Area 51 is built on Intel's new Haswell-E CPU, in what will likely be the last time we see it on an Alienware desktop until Intel's Broadwell rolls around next year. But for now you can rest assured that, as its size would suggest, the Area 51 is a behemoth in power. Alienware's last Area 51 PC showed up in 2010, and looked significantly different to what we're seeing now. The triad shape of the 2014 model means you can rock the unit back and forth, giving you easier access to ports on either side. Each "point" of the triangle is a handle, making it easy to tilt the Area 51 as well as pick it up and move it. The only caveat to that is the weight - at 22Kg (50lbs) this thing is as heavy as it looks. The front face is made of vertical bars, with a power button in the shape of Alienware's famous mascot. Also on the front are two USB slots, an SD card reader, and an optical disk drive. 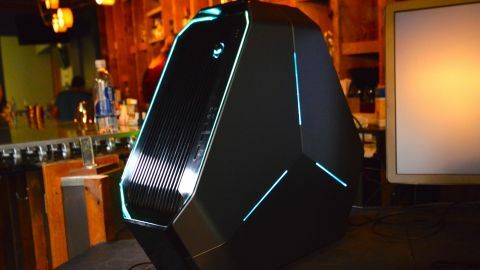 Overall, its a bold step in design by Alienware, and one that'll grab the attention of friends that happen to notice it sat on your desktop like some sort of alien egg ready to hatch out a next-gen ET. Both of the Area 51's side panels are easy to slip off, giving you access to all of the internals. Inside, the UFO can hold up to three full-length GPUs (both Nvidia and AMD are supported) and a maximum of five hard drives. As this is an Alienware product, you can expect a full light show too. Controlled by the AlienFX software, there's a series of built-in lights for which you can customise the colour and behaviour (in Shadow of Mordor, the lights turned red when we were low on health and started pulsing like a heartbeat). In terms of performance, it easily ran the highest graphic settings on Shadow of Mordor, but you'd probably expect nothing less. Again, we'll have to wait until our full review before we can see just how far the 51 can be pushed. The other benefit of the Area 51's design is that it allows proper ventilation even when it's up against a wall, so things should stay reasonably cool when the power intensity rises - though we won't know just how well until our full review. The Alienware Area 51 might look bizarre, but the design has been thought out carefully and makes a lot of sense. Sure, it's heavy and perhaps too big for some rooms, but with some powerful, customisable specs and a look that'll certainly have visitors talking, the Area 51 is already standing out in a market that's becoming a little less relevant by the day.